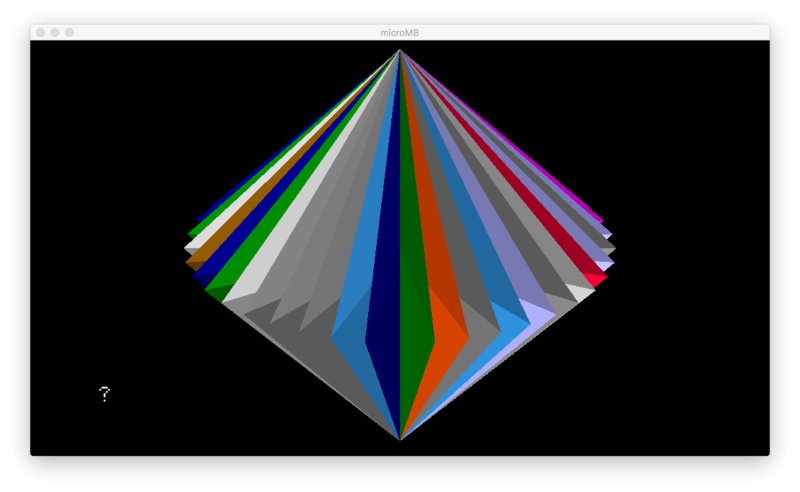 microLogo is an OpenGL 3D implementation of the Apple Logo II programming language. Along with the standard Apple Logo commands (and full Apple Logo compatibility) microLogo features four additional functions: UP (tilt up from the turtle’s perspective), DN (tilt down), RL (roll left), RR (roll right). 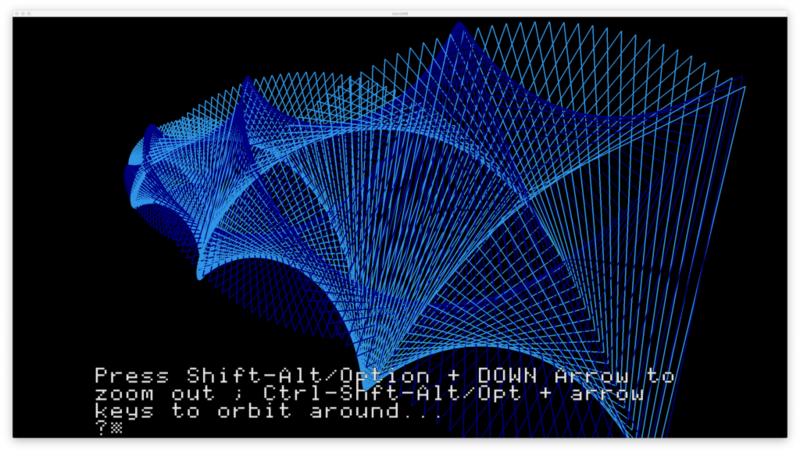 With these four commands you can draw 3D models with the turtle, and then use the camera keys to rotate it! The SETPC command (eg setpc 5) allows you to set the pen colour. It takes a value from 0 to 15. Finally, since our ‘canvas’ has no bounds, if you want the turtle to “wrap” when it would have gone off the edge of a 2D Logo display, use the WRAP command. FENCE will cause an error if the turtle attempts to go out of the normal bounds of 2D Logo and WINDOW returns to an unrestricted mode. NOTE: WRAP doesn’t understand if the turtle moves in the third dimension so results while in that mode using the UP and DN commands are unpredictable! Logo doesn’t just have to be about vectors; there’s no reason why other OpenGL elements can’t be used in microLogo. And so we’ve added the FT and FC (or SETFC) commands. FT draws a triangle in front and to the right of the turtle’s position using the same size units as vectors. In the example above, we’ve made a FT (filled triangle) of 40, then moved forward 40 – as you can see, the turtle is then at the top of the triangle. The turtle does not move when creating a triangle. 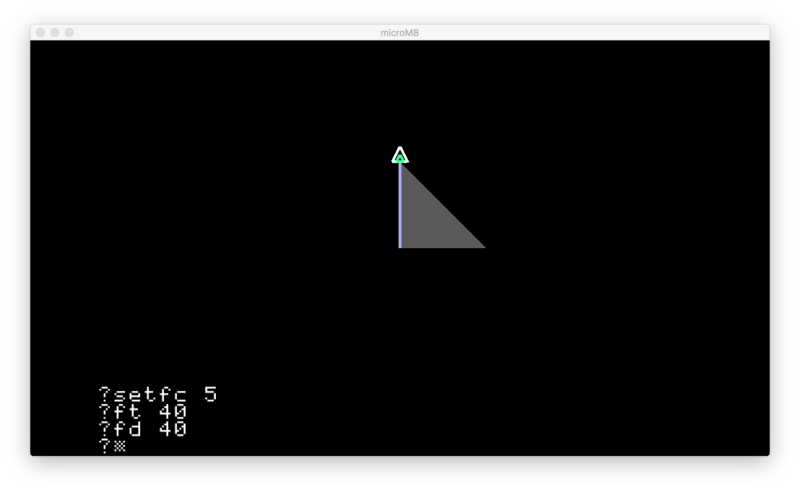 You can use the FC (or SETFC, for consistency with SETPC) command to change the colour of the next triangle you generate, to one of the 16 available Logo colours (same as SETPC). 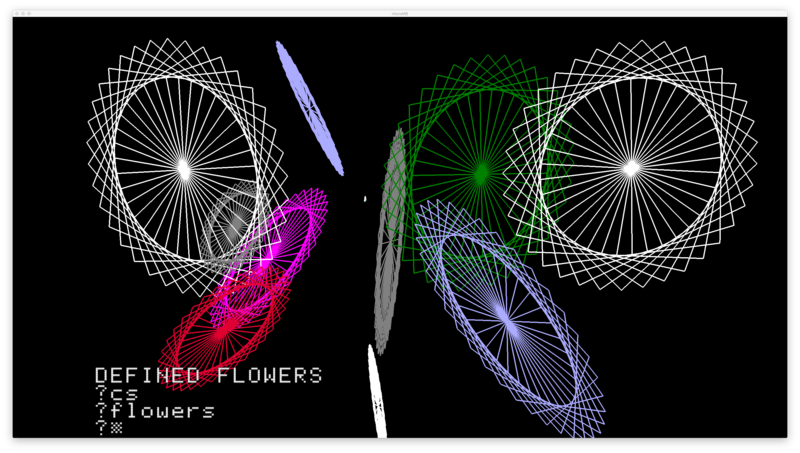 Combined with microLogo’s 3D movement commands, you can create some interesting designs, as in the example below. 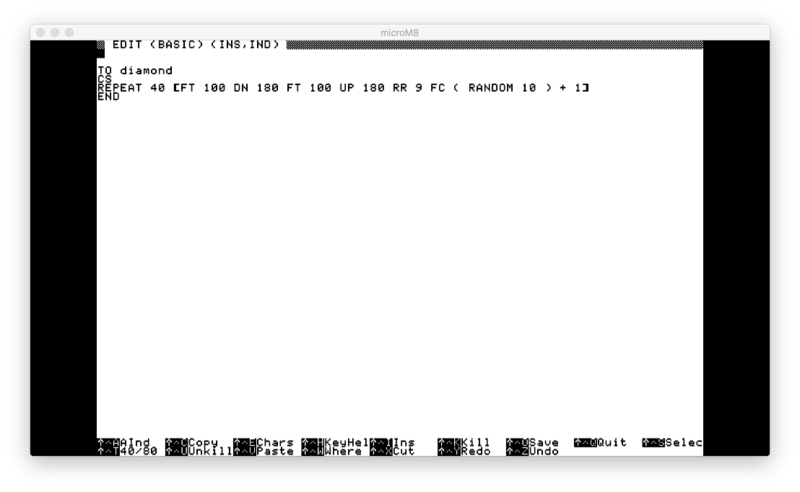 microLogo is part of the microM8 Apple II emulator and can be downloaded for Windows, macOS and Linux. Logo (from the Greek Logos, meaning word or thought) is a computer programming language invented in 1967. A dialect of LISP (a “functional” language where programming is done using mathematical expressions or declarations instead of directives or statements like BASIC) Logo has a fully featured syntax that allows for a wide range of applications…but, let’s face it, the vast majority of Logo’s users have never progressed past the turtle. Not that that’s a bad thing! Widely imitated by many of today’s “learn-to-code” products, the Logo turtle provided a straightforward, interactive introduction to computer programming similar to BASIC, but more visual and relatable by small children. Perhaps the most famous version of Logo is Apple Logo, which quickly overtook BASIC as the learning language of choice in North American classrooms in the early 1980s. 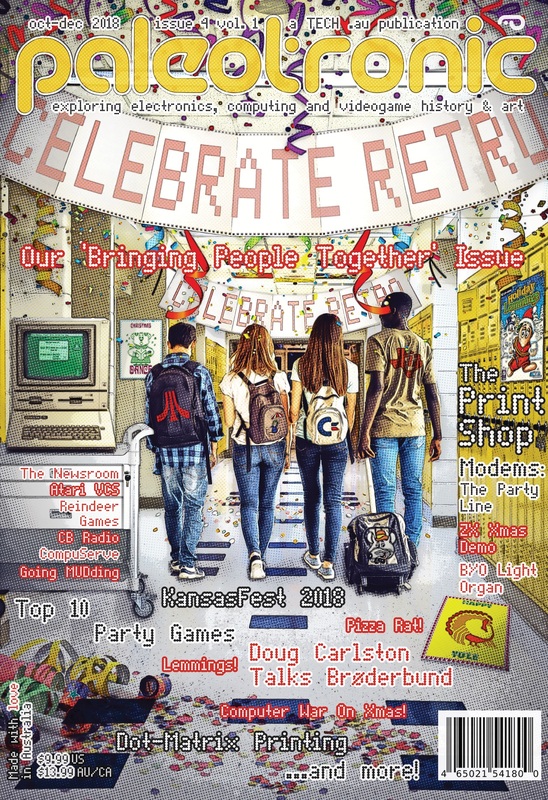 It essentially turned an Apple II into an electronic Spirograph, and students were entranced by the complexity of the patterns they could draw with just a few simple commands.